Porgy and Bess - When George Gershwin wrote this jazz opera in the 1930's he was accused of repeating racial stereotypes and the perpetuation of old prejudices against African Americans. But reading the libretto I realized it has an uncanny resemblance to what I hear from my wife (a medical doctor) returning tired after long days from her “medical mission field” in the Bronx: violence, gambling, fluid family structures, abject poverty, positive drug tests even among grannies in retirement age. But that is only one side of the picture, just as in the opera there is often a marvelous supportive and resilient communal spirit and inclusiveness, raw yet real gentleness, religious moralism but also surprising loving tolerance, superstitious religiosity as well as freethinking (religious skepticism), respect towards real helpers and suspicion towards and rejection of official agents of government. In fact, even many decades later, the opera reads just like a sociological study set to music, and what music! It Ain’t Necessarily So! - Right at the center of the Gershwin opera is this playful song. In colorful Rabelaisian style it says: Don’t trust everything they told you about biblical characters. Although this song is sung by a shady character, a gambler and drug dealer, it represents a bright skeptical protest against biblical literalism and against use of the religion as a tool of manipulation. It was clearly quite close to Gershwin’s own persuasion and was informed by his own upbringing and his own scepticism. The song mentions four biblical characters: David, Jonah, Moses and Methuselah. 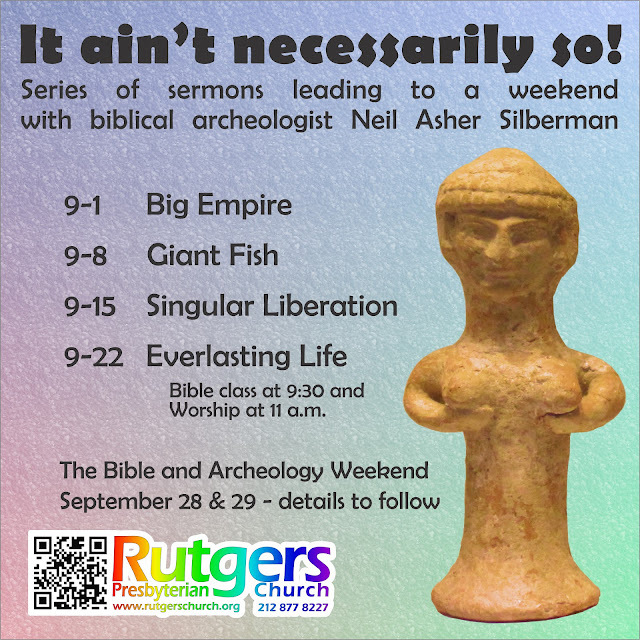 In the first four Sundays in September we will look in order at these biblical characters. We will attempt to liberate them from ideology of biblical literalism and thus allow them to speak to our current political, ecological, social and spiritual issues. Li'l David was small, but oh my! 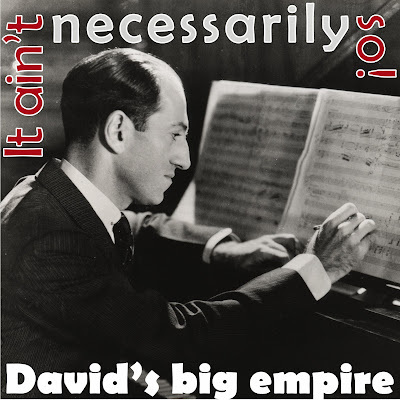 - Yes, this Sunday we start with David and his and Solomon’s elusive empire. Gershwin would been surprised to learn how fully his misgivings about biblical literalism were vindicated and surpassed by recent scholarship. According to the Bible, the empire of David and Solomon should had stretched from the Euphrates to the boarder of Egypt (1 Kings 5:4). But there is absolutely no archeological evidence for it. Despite generations of archeologists’ diligent search for this royal realm, it becomes ever more certain that even Jerusalem at that time was hardly more than a larger village of few hundred inhabitants. It certainly was not the capital of an empire as described in the Bible. This fact itself has great liberating potential! But the stories of David have so much more to offer! Understood as stories and as commentaries about a different historical era, they contain a revolutionary and stark warning message about our human proclivity to abuse power. Simultaneously they highlight the importance of keeping the power under close scrutiny, in our day by supporting whistle-blowers and courageous journalists. And for those who have read this far a few more details. It is becoming ever more clear that the narratives of David and Solomon are modeled on the Israelite (Northern) Kingdom under the Omride dynasty (a different political entity, a different time period). The historical military, political, bureaucratic and social accomplishments of Israel under Omri and Ahab were to a large degree misappropriated by biblical authors, projected further back in history and re-assigned to (most likely) the legendary figures of David and Solomon. Also the final form of these narratives about David and Solomon was heavily influenced by the Ancient Persian, Achaimenid, experience. The entire ambience of palace politics, the intrigues of the royal succession and rebellions, the use of messengers with written texts, multiethnic mercenary armies (even the use of slinger units in combat! - I wrote about it about a year ago here.) nicely correlates with the late Persian period and even better with the Classical or early Hellenistic literary rendition of this period. These observations have a profound affect on our understanding of these stories. Take for instance the famous story of David and the wife of Uriah which has a close parallel to the story of Ahab and Naboth’s vineyard. As soon as this close parallel is recognized and taken seriously, it becomes clear that the Bathsheba story is not primarily about sexual morality but about abuse of power. Brutally realistic, non-hagiographic, almost cynical depiction of legendary heroes further highlights the need for constant vigilance towards those in the positions of power. The higher and greater the power, the higher and greater is the need for close scrutiny. Curious what we are preparing for this September? David, Jonah, Moses, Methuselah? - It ain't necessarily so! And archeology weekend with distinguished archeologist and author to crown it all on Simchat Torah weekend! It ain't necessarily so, what they taught you in Sunday Schools, what you heard in churches, often put so that it would bind you by prejudice and fear. Truth is interesting. It broadens our understanding of ourselves. It deepens our appreciation of life. It has power to set us free. Come and join us! OF COURSE NOT! But perhaps, they should give it some thought! I do not mean any strange and peculiar form of worship, no trance dancing around camp fires, no spiritistic seances or veneration of saints, rather I am thinking about recognition and acknowledgment that we do not live in vacuum. We have roots, and we can draw strength and hope from them! After all, we are who we are because of thousands of genes we inherited from our ancestors. We came to life only because of our parents, and their parents and theirs... 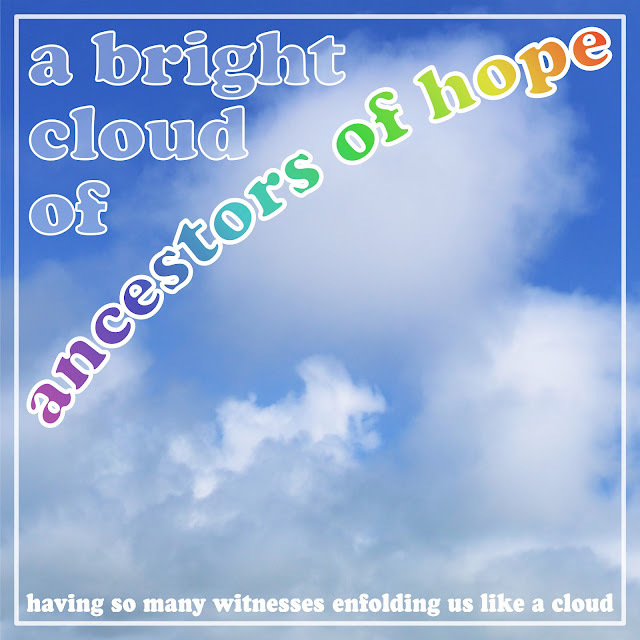 But true ancestors, in a spiritual sense, are a broader category than that! We are who we are because of the complex interactions and influences of society, our teachers, pastors, mentors, colleagues and friends.... We live and can exist only as an interwoven part in the broadest tapestry of life. Modernity, especially in its superficial-consumerism form or in its more sinister totalitarian form, attempted to cut people off from their ancestral roots. That way, it was easier to delude and manipulate them. And it is true that ancestors could hardly have helped us with the complex new aspects of our lives and technological advancements. But that is not and never has been the role of true ancestors. Their primary function has always been to provide spiritual and emotional grounding and a safe haven, to remind us of our roots, and to reintegrate us with the ancient and broad river of life. That is not that foreign to our Calvinistic faith as it might first sound (didn’t I call us Calvinists just this moment?!). Come this Sunday: under biblical inspiration we will seek together, celebrate and draw strength from our personal as well as shared spiritual ancestors. Can a Muslim scholar write a book about Jesus? Of course he can, especially if he is as gifted a writer as Reza Aslan! His book is titled “Zealot, the Life and Times of Jesus of Nazareth” (Random House, New York, Summer 2013). He has been viciously attacked by militant evangelicals and American conservatives alike, because he writes about Jesus who was born and grew up in Nazareth (not Bethlehem! ), who was an non-literate peasant laborer, who was loyal to the Torah (the Law of Moses) as he understood it, who preached kingdom of God as an earthly benevolent theocracy, who criticized the imperial Roman occupation and economic exploitation, who challenged local priestly and aristocratic “quislings”, and who was executed by the Romans for his provocative social/religious/political program, who never really intended to found a new religion and even less the Church, and whose resurrection is historical in so far as it is a religious and theological statement of his followers, a new step in the development of his movement towards a new religion eventually quite different from his own intentions. Now you know why this book is so controversial: the Conservatives hate it because of this social-justice Jesus, the Evangelicals do not like this social-justice Jesus either, and they dislike this historical critical approach even more. And cultural and religious chauvinists dislike the fact that the Muslim so aptly investigates the roots of their own tradition. I think it is a scandal that this book is such a scandal! The problem is not the book, but the reactionary response from so many! Aslan’s book contains hardly anything new or controversial for those who pay any attention to biblical scholarship. The German thinker Herman Samuel Reimarus (born 1697 died 1768) reached very similar conclusions centuries ago and the study of the Bible did not stop there! That is the biggest problem of Aslan’s book. It suffers from a malady so common in popularizing literature: It is well written with a real belletristic flair, but it popularizes scholarship, hardly cutting-edge which is sometimes more than 50 years old. Aslan is criticized for being too radical, but, frankly, he should be criticized for not being radical enough. Similarly, he is criticized for being Muslim, but this book is most valuable where it is most Muslim, bringing forward the Semitic ethos and prophetic zeal for fairness, and for political as well as social justice. This Sunday’s lectionary reading is bringing to us a zealous Jesus, radical and revolutionary. The one who opened his discourse with saying “My mission in life is to bring a revolution, and I’m longing to see the sparks fly!" or in a more traditional translation “I came to bring fire to the earth, and how I wish it were already kindled!” (Luke 12:49). 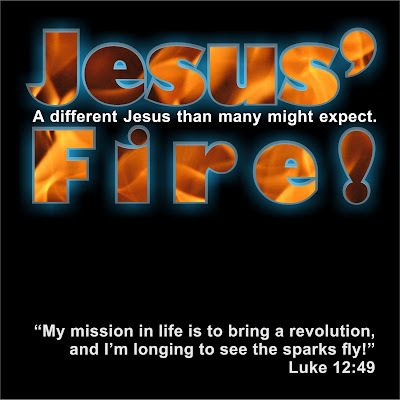 Come to hear this radical passionate Jesus and to seek and rekindle his holy prophetic flame. Right at the beginning (page 4) - Jews in Jerusalem were changing coins for coinage acceptable in the Temple, but they were not changing “foul foreign coins for the Hebrew shekel”. It is a well known fact that the temple coinage in Jesus’ time was actually the Tyrian shekel. It was as pagan and “foul” as it could get with the depiction of the Phoenician god Melkart on it. Of course we could hardly ever know why one pagan coinage was accepted and the other not; most likely it was a statement against the cultural and imperial hegemony of Greeks and Romans. This is just the first example of factual inaccuracies in this book. Throughout the book, Aslan is biblically credulous, not always exercising proper text-critical caution. For example he presents the kingdom of David and Solomon as a historical reality, or he relies uncritically on Luke’s account of the early church as recorded in the Acts of Apostles. Far from being a disrespectful Muslim, in many places he is actually showing exemplary Muslim religious credulity to religious texts and deference to their religious authority. In it, he is closer to his evangelical critics than both sides recognize. I love occasional open-air worship services. In my homeland (the Czech Republic) we would gather for worship in places significant for Reformation history. My previous upstate church had a tradition of an annual open air worship followed by a picnic and barbecue. I even find grave-side funerals deeply meaningful. At Rutgers we celebrate St. Francis with the blessing of the animals in Riverside Park (weather permitting). When I travel, I like to visit open air places of worship; the Heiaus of Hawaii are excellent examples of such open air temples. In all these different open-air situations and settings, religion is still very much integrated with the rest of nature. Faith is not torn out from the rest of life, extricated, isolated, completely enclosed in man-made structures, pushed to an anthropocentric preoccupation with only human motions and emotions. In the open air, a blade of grass is waving in a breeze, a lonely ant is wandering across a sand path, even an occasional rain shower, a buzzing fly or whizzing mosquito all belong to this picture just like the chirping birds in the trees. In such a setting, nature is unavoidably a part of religious experience and religion is inevitably integrated into the broad diversity of life. Such a setting undermines all artificial pomposity and religious hubris and indirectly, yet unavoidably, reminds us that we cannot extricate ourselves from nature, even in the midst of our most sublime religious aspirations, we belong among all other creatures. I acknowledge that all this might sound very “new-agey”, if it was not as old and as elemental as the deepest roots of our faith! This Sunday we will not worship outside (unfortunately), yet the biblical readings (Gospel and Psalm) will bring to our worship rowdy sparrows as well as swift swallows, reminding us of ancient yet still vitally important layers of our faith. 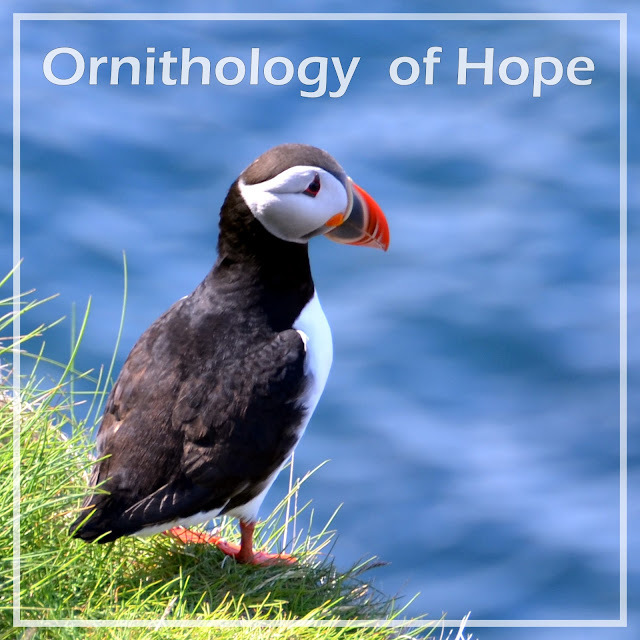 This biblical ornithology will lead us deep into pre-Jerusalem worship and invite us back into the universal solidarity of living. No matter how urbanized we might become, we cannot separate ourselves and our faith from nature. a song for the Shaved Boys. How special is your residence, O Lord of Hosts! my heart and my body celebrate the God of life. to bring up their broods around your altars. their chirping can praise you all day long. I acknowledge that Atlantic Puffin isn't particularly "biblical" creature but we are to seek hope in the universal solidarity of living. And besides, it is a lovely colourful bird and further I took this picture in Vestmannaeyjar (Iceland) and thus I own the (c). Most likely, this is the original form of this story. It has a straightforward, simple storyline and no fancy elaborations. The story clearly criticizes the egotism of the wealthy, but it is predominantly just a direct, urgent reminder “Memento mori!” - Remember your mortality! As brutal as it might sound, such stern reminders have always been an important part of the religious moral teaching. It is clearly the same story like the one from Gospel of Thomas, only slightly expanded. Yet this expansion is not any arbitrary decoration but it certainly makes this story livelier - just imagine God calling the rich in plain street lingo! This version also highlights social inequality and deep social tensions (including robbers or rebels taking the rich man’s life). But especially, it adds the two level soliloquy, surprisingly, this parody feature unlocks some originally hidden possibilities. This story is not any longer that stern threat of "Memento mori" now it contains a positive message and a gentle nudge towards a joyful turn of life. We will try to tease it out and experience it this Sunday. Come to celebrate! I spent some time attempting to achieve the most accurate translation. This story is traditionally presented as a folksy story of a farmer who got lucky in an unusually productive year. But, that is not what Luke is talking about. First of all, the man in the story is never called a farmer. He is characterized as “rich” but such translation is imprecise. The Greek word used to describe him is PLOUSIOS, which means so rich that the person did not need to work for living; he was an aristocrat, or we might say he was wickedly, disgustingly rich. This is further confirmed by his land ownership. The story does not speak about any field or even fields (that would be AGROS in Greek) he was receiving proceeds from the entire countryside (CHORA) and he wanted to store not only his crop, but also all his goods. The unjust distribution of wealth always leads to social tension which can boil up into violence. This reality is being hinted at in the threat to the aristocrat’s life. This threat is not coming from God; that is a common and unfortunate misunderstanding. His life is threatened not by God, but by some unnamed “them” - third person plural. Most likely these “they” were some kind of outlaws (insurgents or social or political rebels/revolutionaries). The two levels of soliloquy (he is saying himself what he is going to say to himself) have a clear parody dimension. Even a planned thanksgiving prayer of an egotist cannot transcend above his own bloated ego. That could be a sad statement of reality, but also can serve as an starting point for correction and a new perspective. This wake up call is supported by another shocking and/or humorous device - God is said to be using vulgar language. Greek AFRON was certainly stronger than just “you fool” (as it is traditionally translated). “You moron” or “you bonehead” provide more appropriate emphasis for this important wake-up call.